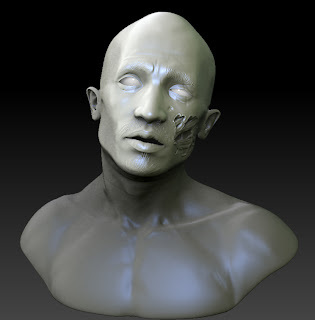 Hi this is a recent test I did for TNG Visual Effects, which offers 3D scanning services for film and tv production. The test consisted in reorienting, retopologizing, unwrapping, sculpting, optimizing and finally texturing a 3D scan of a head. I learned a lot during this process, mainly the use of ZAppLink and Projection Master in ZBrush, as well a masking texture cavities to obtain detailed 3D information from photographs. The render was done in Zbrush in only one pass. I used the SkinShader Matcap for the head and they ToyShader for the eyes. I also played with the Fog option to give some colour to the scan and the background. This is a recent rig I've been currently working on. It was created using MEL expressions and nodes to achieve the desired stretch and squash deformations. hi! I haven't updated this blog in a long time. I've been quite busy with work, but I try to find time to keep practicing high res modeling in zbrush, looking to improve my skills and experimenting with new brushes and options. In this sketch I wanted to achieve a semi-realistic look in order to better understand bone structure and facial features. This is my final modeling/texturing reel after completing the Digital Animation program at Capilano University. Gus' Dock was a final group project for the end of my first semester at Capilano. From concept to finish the team (Kate Craig, Shu Chai, Bruce Chang, Eric Emard and myself) worked extra long hours for a period time of two and half weeks. I mostly worked on the modeling, texturing and rigging of Gus. Hi this is my first post. 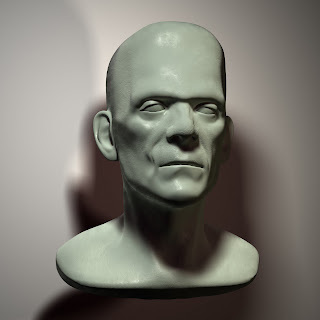 The Frankenstein monster is my favorite classic monster and I thought it would be fun to do a bust of it in 3d. It's a work in progress at the moment, but I intend to texture and give it a realistic look. I modeled a simple base in Maya, then sculpted the rest in Zbrush. I wanted to try to do a render a this point, so I brought the OBJ into Maya and set up mental ray lights and gave the the model a clay look. Hope you like it, I'm planning to do tutorial and show my process once I finish it.